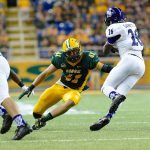 Four players including Nick Shafnisky from Lehigh, Eli Jenkins from Jacksonville State, MJ Stumpf from North Dakota State, and Antoine Custer from Eastern Washington have been selected as the College Sports Journal All-Stars for the week ending September 18th, 2016 in the NCAA Division I Football Championship Subdivision. 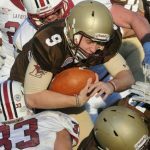 Shafnisky led the Mountain Hawks to a 49-28 victory over Penn, their first win of the season, completing a career-high 28-of-41 passes for 317 yards and three touchdowns, while also rushing for 71 yards on 12 carries and three more touchdowns. 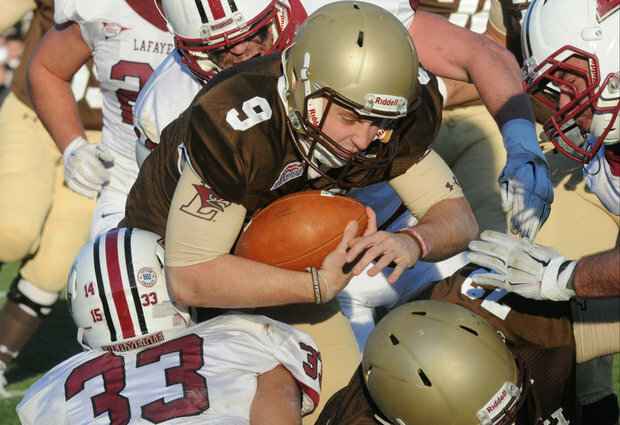 It was his fifth career 300-yard passing game, while his six touchdowns accounted for is also a career-high. He also averaged 5.9 yards per carry with no negative rushes, while completing passes to six different receivers. 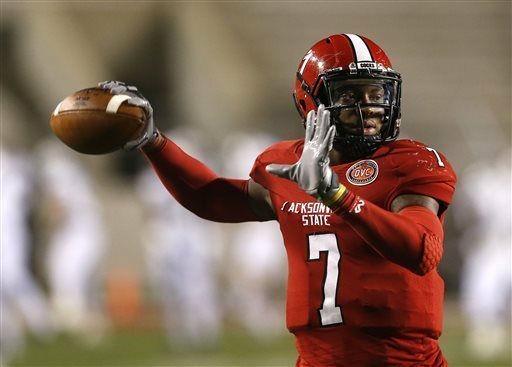 Eli Jenkins, Jacksonville State, Sr., QB, 6-2, 210, Birmingham, Ala.
Jenkins accounted for 359 yards of total offense and three touchdowns as the Gamecocks defeated FBS transitioning Coastal Carolina 27-26. He completed 18-of-34 passes for 248 yards and two touchdowns and carried the ball 20 times for 111 yards and another score. It marked the ninth 100-yard rushing game of his career and put him over 3,000 career rushing yards, marking him the fifth player (and first quarterback) to reach that mark. He currently leads the OVC and ranks 20th nationally in rushing (98.0 yards/game). 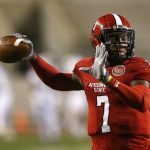 With the Gamecocks trailing by six in the fourth quarter, he took JSU from its own 13-yard line and led an 11-play, 84-yard drive that ended with him rushing for the 14-yard game-winning touchdown; Jenkins was 4-for-4 and accounted for 82 yards (50 passing, 32 rushing) on that drive. Stumpf’s 21-yard interception return for touchdown in the first quarter gave NDSU the first lead of the game in an eventual 23-21 victory over the FBS Iowa Hawkeyes. It was the first career interception for Stumpf, who was part of a defensive unit that held Iowa to 34 yards rushing in the game and minus-7 after halftime. 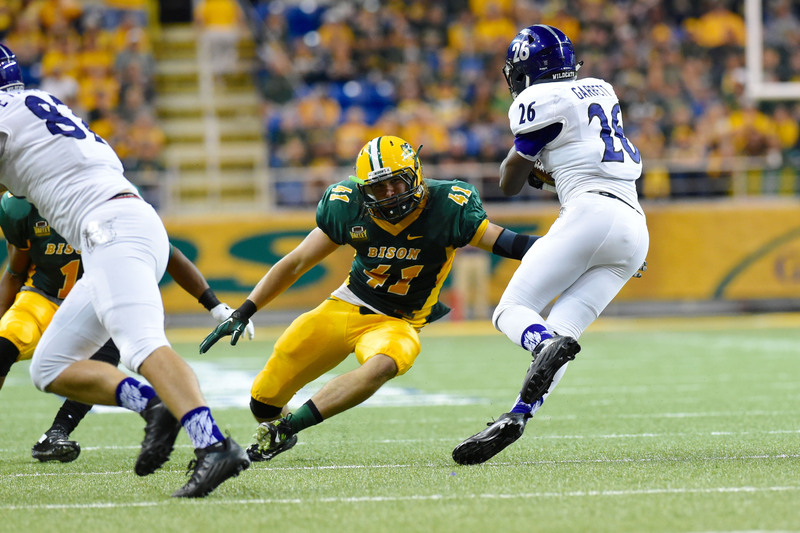 Stumpf also downed NDSU’s opening-drive punt at the Iowa 2 to set up one of five Iowa three-and-outs in the game. He finished with three tackles. 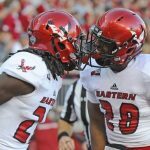 With Eastern Washington trailing by 17 points at halftime to visiting Northern Iowa, Custer took the opening second half kickoff 93 yards for a touchdown, jumpstarting a EWU comeback. It was the true freshman’s first special teams touchdown, in his first-ever return for Eastern Washington. 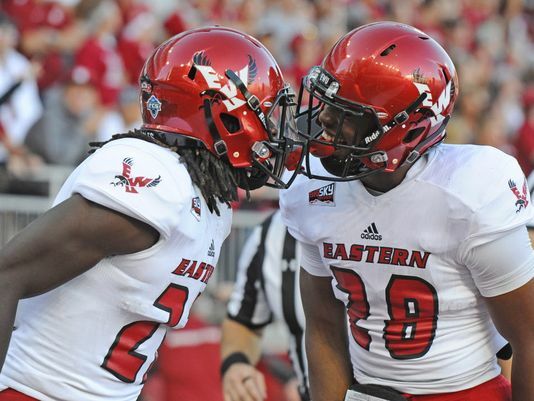 EWU would win the game 34-30.